I love riding my bike, but lately I’ve noticed that within minutes of setting off on a ride in the city, I usually want to kill someone. I love the feel of the breeze, and the ease of getting around far faster than walking and without waiting in lines of backed-up automobile traffic. But I find I’m also on hyper-alert for danger – a car parked in a bike lane, a spaced-out pedestrian crossing the street, a monster-sized SUV speeding up behind me. That reaction is understandable, even necessary. But living with that kind of vigilance also gives me a warped view of the world around me, leaving me feeling like a victim of what seems like the city’s endlessly aggressive energy. It’s exhausting. So my intense reaction to someone making a wrong move – opening a car door without looking or swerving their truck into my bike lane – may be perfectly natural. But cursing out the careless driver or pedestrian, fantasizing that I had a rock to throw at his windshield, isn’t actually a very helpful response. In fact, it can ruin my bike ride, or at least make it much more stressful than it needs to be, which also makes it more dangerous. 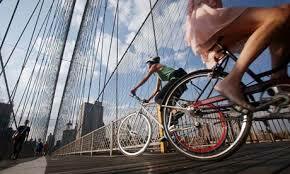 Plus, it can send me on a downward spiral: I start to feel like riding a bike in the city is just a lethal exercise. Then, I wonder, why do I live in a city where everyone is out to kill me? Finally, I turn it inward, and I’m just angry at myself for living in this crazy place. I think the key to anger and fear of any sort is perspective—stepping back to see what’s underlying it, and how our minds, caught up in those emotions, distort reality. That doesn’t mean we shouldn’t let ourselves experience them. As psychologist Tal Ben-Shahar says, the only people who don’t experience painful emotions like fear and anger “are the psychopaths and the dead.” The key, it seems, is to let yourself experience the emotion, but to pause before reacting to it – or at least to question your reaction, if it’s automatic. Marshal Rosenberg, a psychologist who created a powerful method of conflict resolution called Nonviolent Communication, talked about anger as a sign of unmet needs. If we can recognize the anger, pause, and identify our unmet needs, he explained, we can focus our energies on meeting those needs, rather than on judging or harming other people. That turns out to be far more productive. “Killing people is too superficial,” Rosenberg wrote in his groundbreaking book, Nonviolent Communication: A Language of Life. The process he recommends “does not encourage us to ignore, squash or swallow anger, but rather to express the core of our anger fully and wholeheartedly.” That would be after figuring out what needs are underlying it. In the case of riding my bike, of course, my need is for safety. And yelling at the person who just stepped in my way isn’t going to make me any safer. It may do the opposite. What will make me safer, and what I’m increasingly trying to do, is to just accept that there are some people on the road who will park or walk in the bike lane, and that they’re going to do it whether I fume at them or not. If I can accept that it will happen and be alert to but relaxed about it, I don’t have to get so angry. My anger also compounds the problem by distorting my perception of the situation: most of these people aren’t actually trying to hurt me, they’re just not paying attention. In fact, if I think about it, far more people are actually complying with the traffic restrictions than aren’t. Cars are parked in a line all along one side of the bike lane, and the vast majority are not crossing it. The same is true for the people driving the cars in the street; although some are careless, most actually don’t cross into the bike lane, or try to hit me when they pass me by. I rarely stop to think about that (that’s the Teflon at work), but keeping it in mind can help me relax and direct my anger at the transgressors a bit more skillfully. The truth is, the anger that arises in these sorts of situations can be really useful, if understood and well-directed. Cyclists’ anger at the dangers posed by motor vehicle drivers has led to an impressive movement in New York City to support more, safer, and more visible bike lanes around the city. Transportation Alternatives is one of the advocacy groups leading that effort, and I think it’s done a great job harnessing and directing cyclists’ and pedestrians’ anger about the very real dangers on city streets, including calling attention to the deadly car crashes that happen on pretty much a daily basis. It’s a great model for how to use anger to promote a common good. But learning to respond to anger constructively isn’t easy. It takes conscious intention, effort and practice. Which is yet another reason to get out and ride. This entry was posted in Advocacy, anger, coaching, fear, positive psychology, psychology, social justice and tagged advocacy, anger, biking, coaching, cycling, fear, Marshall Rosenberg, New York City, nonviolent communication, psychology, Rick Hansen, Tal Ben-Shahar, Transportation Alternatives. Bookmark the permalink.